I recently visited a Greek Orthodox Monastery in southern Arizona. It was a beautiful, peaceful place. 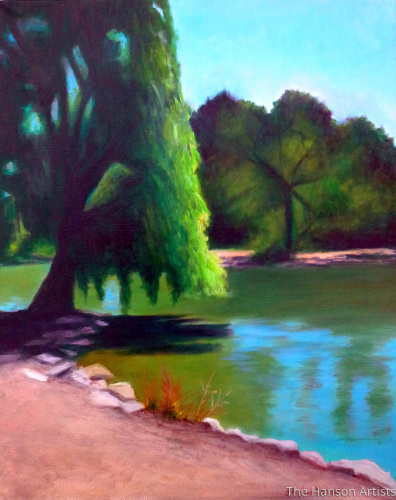 There will be more paintings to come from this area. 6.75" x 5"9.25" x 7"12" x 9"14.5" x 11"17.25" x 13"21.25" x 16"
This is another view of of the many beautiful areas from St. Anthony's Greek Monastery in southern Arizona. It is such a beautiful and enchanting place to see. 6.75" x 5"9.25" x 7"12" x 9"14.75" x 11"17.25" x 13"21.5" x 16.25"
NM. 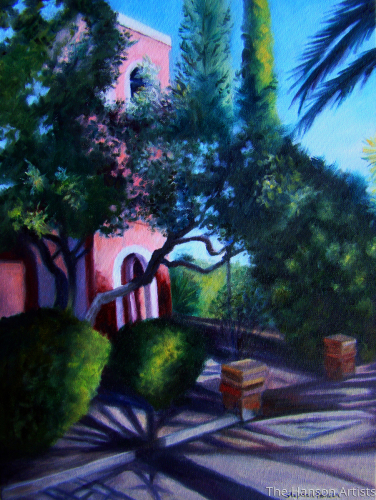 I've done a series of a few paintings of this old mission. We just visited this place last in the fall of 2017. 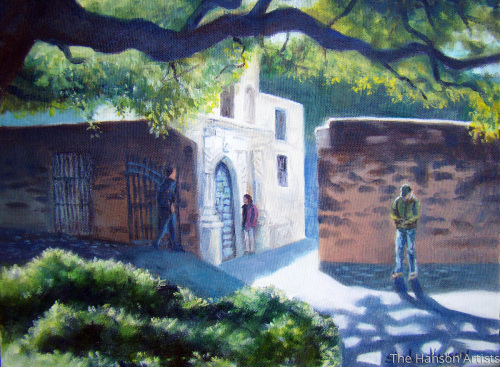 5" x 6.5"7" x 9.25"9" x 11.75"11" x 14.5"13" x 17.25"17" x 22.5"
This is one of three paintings I've done now of a church mission in New Mexico. 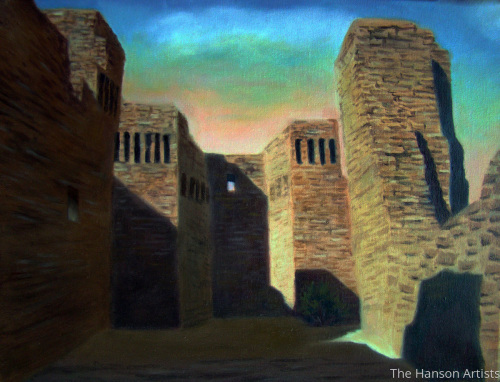 I was fascinated by the old stone walls and how they entire place was created. 5" x 6.5"7" x 9.25"9" x 11.75"11" x 14.5"13" x 17"17.25" x 22.5"
This is another view of the Mission area near Mountainair, NM. There are a lot of various areas that encompass this mission. 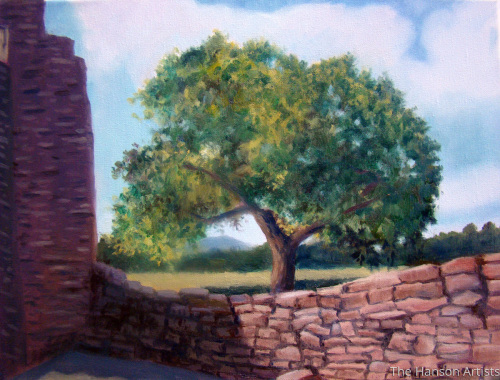 5" x 6.75"7" x 9.25"9" x 12"11" x 14.75"13" x 17.25"17" x 22.75"
"Another View of the Alamo"
I decided to paint another view of the Alamo while we were visiting a while back. Adding the figures to it seemed to also add another element to the scene. 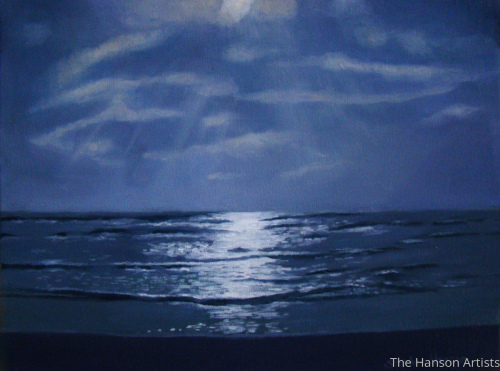 5" x 7"7" x 9.5"9" x 12.25"11" x 15"13" x 17.75"17" x 23"
This is one of two seascapes I painted while we were at Padre Island recently. The ocean's waves and sky seemed to emanate a silvery blue color overall. It was enchanting. 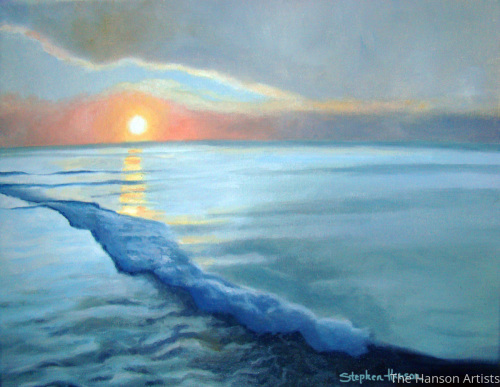 5" x 6.75"7" x 9.5"9" x 12"11" x 14.75"13" x 17.5"16.75" x 22.5"
This is my third seascape of Padre Island. It is a magical place watching the powerful surf come rolling unto the shoreline. 5" x 6.5"7" x 9"9" x 11.75"11" x 14.25"13" x 16.75"17.25" x 22.25"
We just spent a week here at North Padre Island in our camper. We were dry-docking, but the ocean was beautiful. 5" x 6.75"7" x 9.5"9" x 12"11" x 14.75"13" x 17.5"16" x 21.5"
We found a great camping spot just west of Divide, Colorado. I saw this old stump next to one of the trees and thought it would make a good composition. 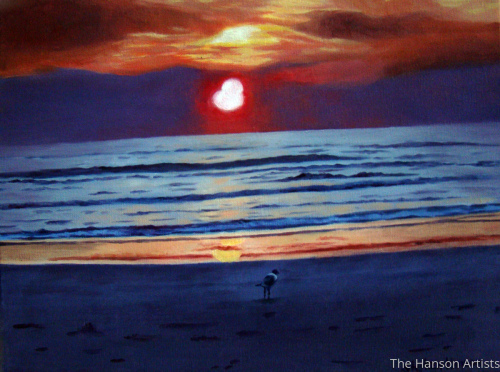 6.5" x 5"9.25" x 7"11.75" x 9"14.25" x 11"17" x 13"22" x 16.75"
This is another recent seascape painting from the North Padre Island area. 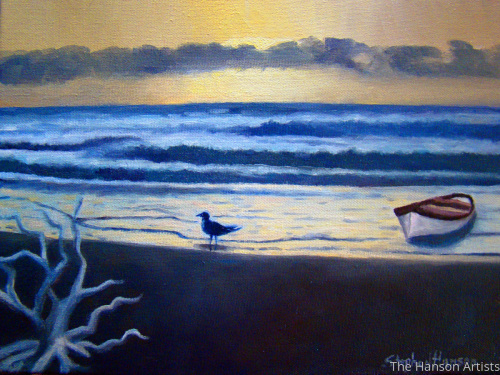 I wanted to incorporate a boat and a bird this time, to add to the sense of reflecting. 5" x 6.75"7" x 9.25"9" x 12"11" x 14.75"13" x 17.25"17.25" x 23"
These types of trees are seen throughout Texas. 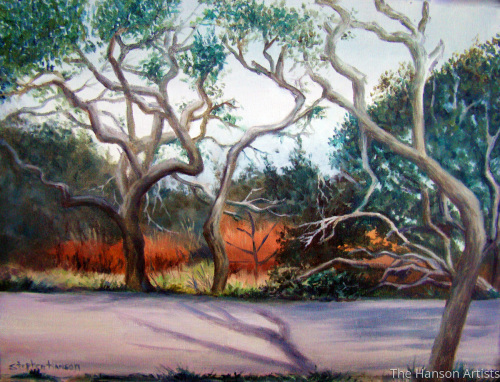 These life-oak trees have unusual curving limbs and have the appearance of being wind-swept. 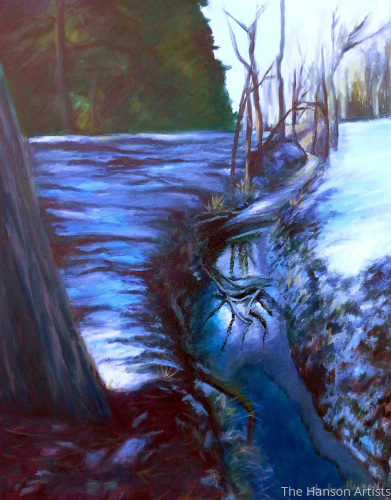 This winter painting shows the beauty amidst the forests and mountain rivers found in our area. 5" x 6.25"6" x 7.5"7" x 9"8" x 10.25"9" x 11.5"10.75" x 13.75"
During our travels we stayed at a state park near Austin and it had some very unusual trees nestled around the water. It was an enchanting place. 5" x 6.5"7" x 9"9" x 11.5"11" x 14"13" x 16.75"17" x 21.75"
We've been staying at Rockport, Texas the last week, and I thought this place next to a small pond offered some good views. I couldn't help but notice the pink flamingos. 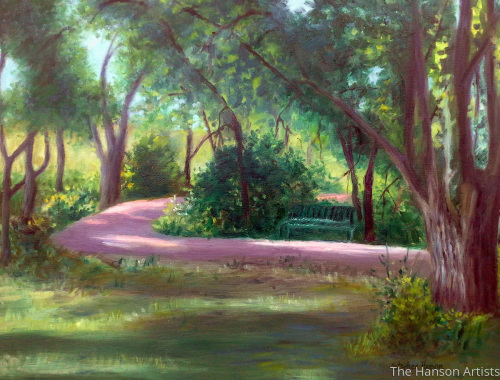 The park went through the hurricane last summer, but the people are resilient and have made this place their home. 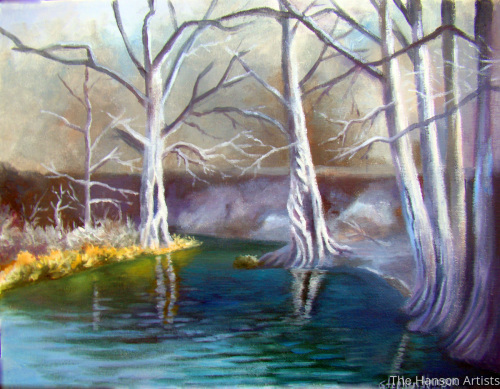 "River Scene at Tres Rios"
Our stay at Tres Rios RV park has been great, as there are so many unusual and beautiful scenes. There are three rivers that cross here. 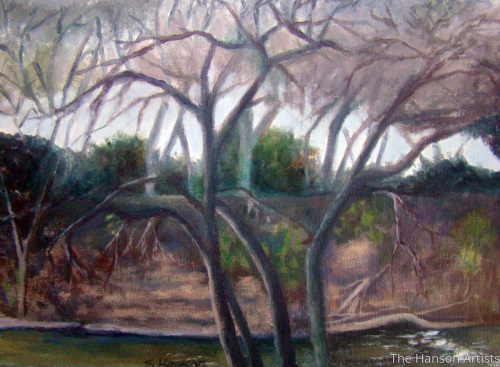 There are oak trees sprawling up around the river at Tres Rios RV park. 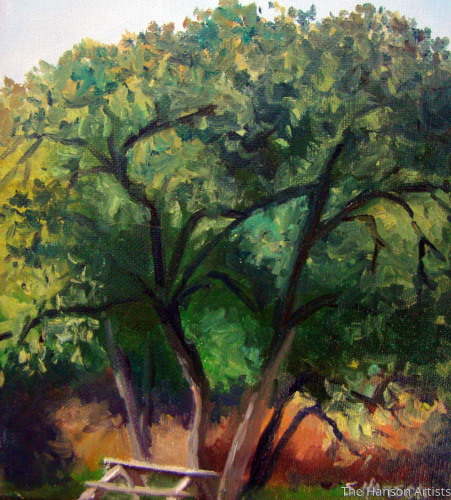 This particular scene beside the river, had a little picnic table beside the old oak tree. 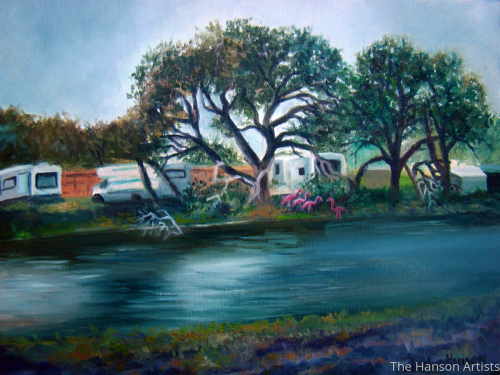 This was painted at Rockport, Texas at an RV park. We stayed around a pond and all the various RV's were parked around it. It was a great place to stay for a while. 5" x 6.75"7" x 9.25"9" x 12"11" x 14.75"13" x 17.5"17" x 22.75"
Just down the road a ways, is Tarryall Reservoir, where many go fishing. But we just went for the day to do some painting. Recently we stayed at a state park near Whitney, Texas near a beautiful lake. 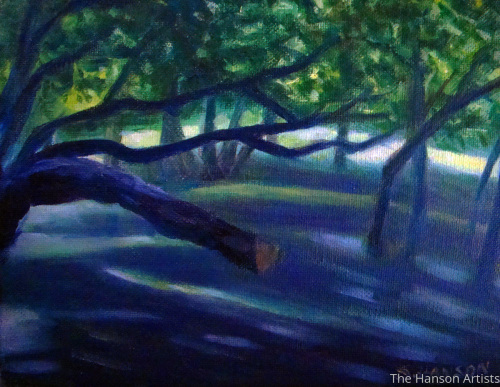 We were surrounded by beautiful oak trees and sunlight. 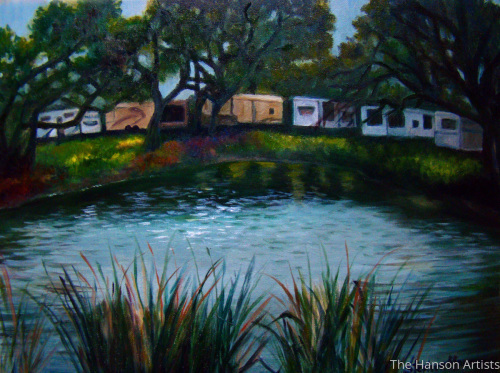 5" x 6.25"7" x 8.75"9" x 11.25"11" x 13.75"13" x 16.25"16.5" x 20.75"
This is another scene at Tres Rios RV park. 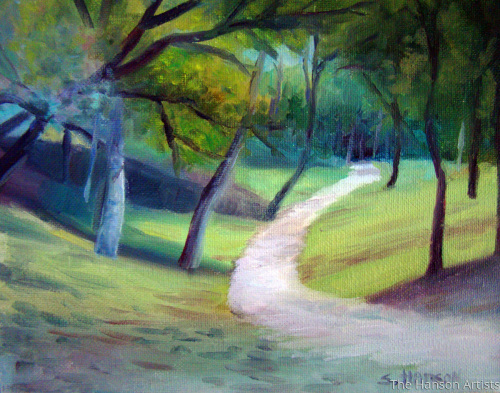 I love to walk along the pathways and imagine hidden places. It almost has a sense of mystery. 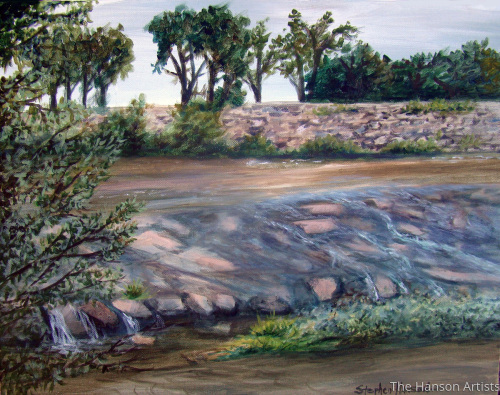 This is one of several paintings I've done along the Arkansas River. 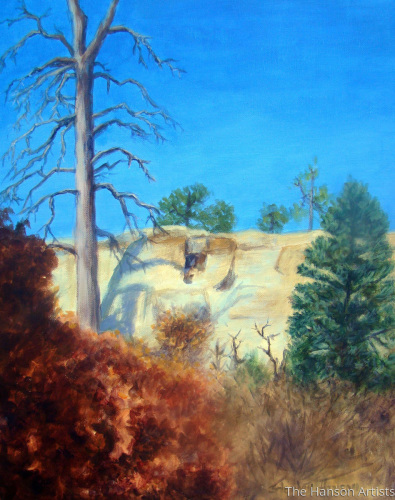 I painted several paintings in the Cheyenne Canyon during the summer and fall months. It's a beautiful place. 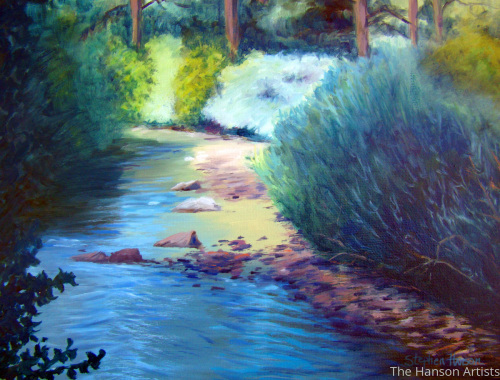 I found a really beautiful spot to paint at a nearby mountain stream. The water was flowing and bubbling over the rocks as it meandered down in front of me. I found this beautiful little hidden place in a park. 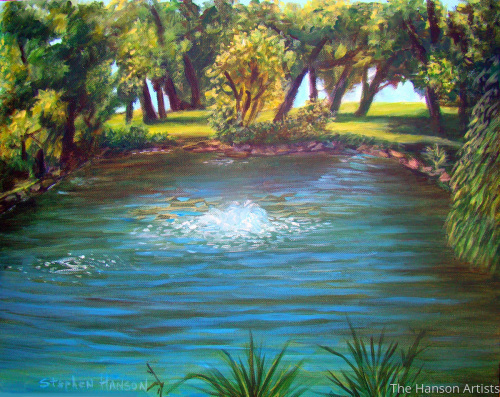 The trees and pond offered a peaceful place to sit and enjoy nature. 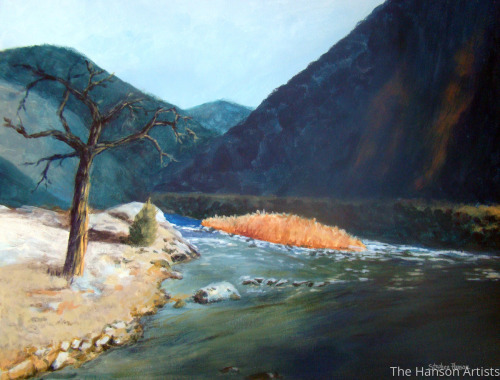 Our family went camping a few years ago next to a flowing creek. It was a wonderful time of memories and beauty. A few we had a family reunion in southern Kansas. 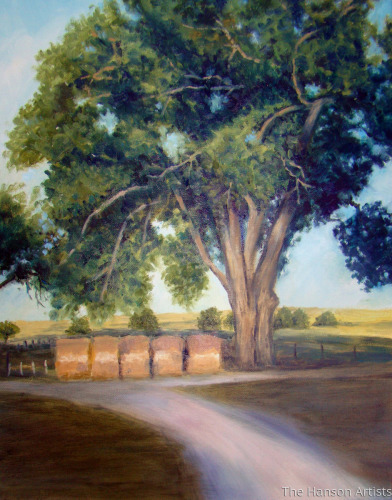 This painting typifies the area with its cottonwood trees and rural setting. 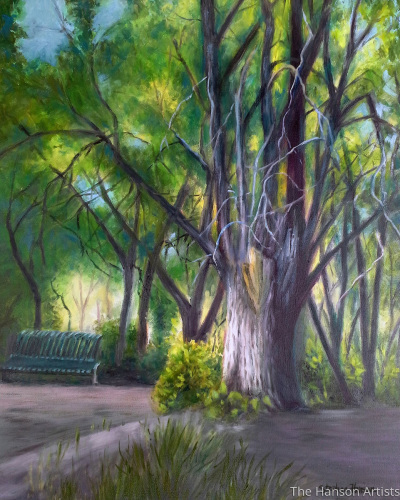 6.25" x 5"7.75" x 6"9" x 7"10.25" x 8"11.5" x 9"13.75" x 10.75"
This is a smaller version of the painting "Bubbling Up" that I did in a beautiful little park in Colorado Springs. 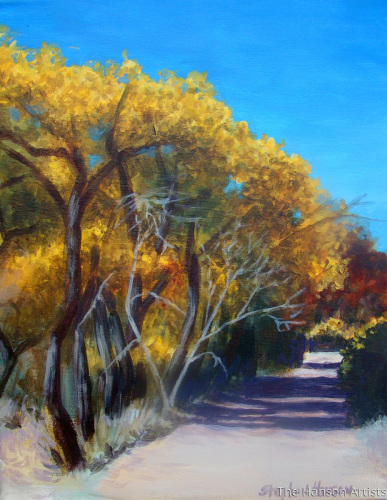 On a trip to New Mexico several years ago, I noticed some cottonwood trees along a dirt road. It reminded me of the many trees like this that I had seen as a child growing up. 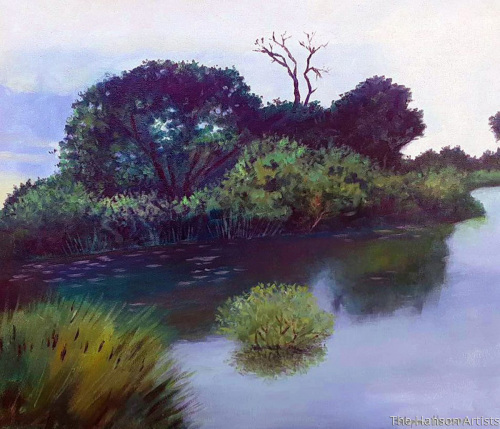 I've painted several pieces from this pond area over the last few years. 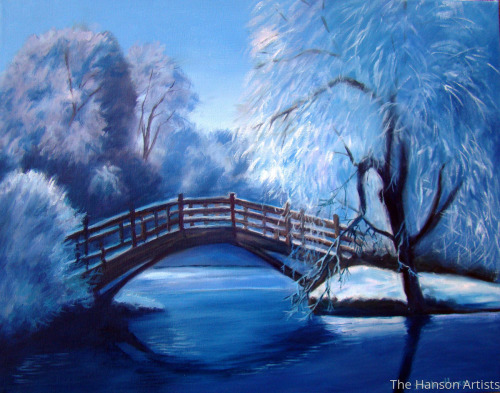 It's a beautiful spot to paint or just sit and enjoy the beauty. 6.25" x 5"7.5" x 6"8.75" x 7"10" x 8"11.25" x 9"13.75" x 10.75"
We have a beautiful little nursery here in town and one day as I went to visit it, I noticed this old vehicle with the sign on it. 5" x 6.5"6" x 8"7" x 9.25"8" x 10.5"9" x 11.75"10.25" x 13.75"
We stayed at a RV campground recently, and there was a little pond that people fished at. 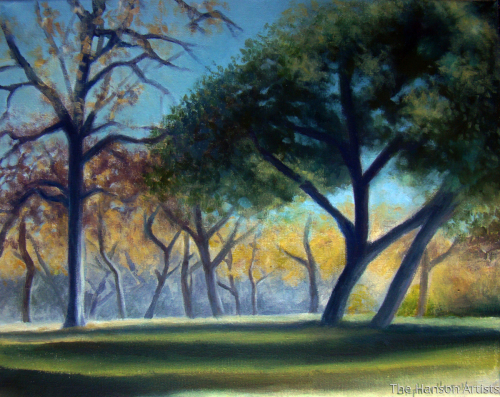 The trees and the light was wonderful, so I decided to paint it. 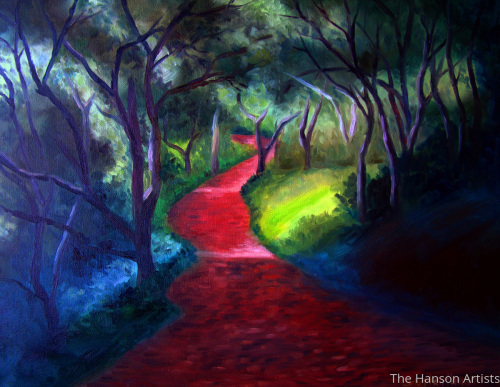 5" x 5.75"6" x 7"7" x 8.25"8" x 9.25"
This is a hidden pathway that goes mysteriously into the trees. 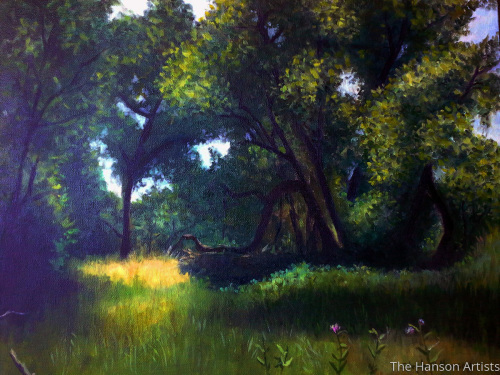 5" x 6.5"6" x 7.75"7" x 9"8" x 10.25"9" x 11.75"10.25" x 13.25"
This oil painting was done just recently over the first week in June of 2013. 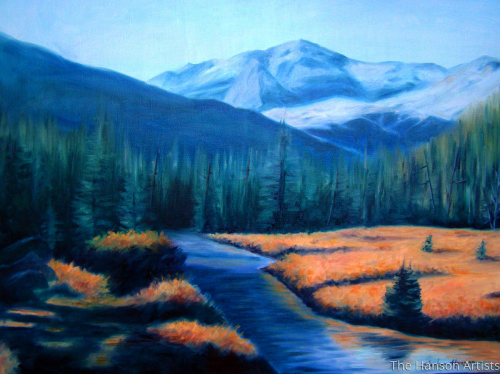 I wanted to show the beauty and wonderful vistas that are often found in the Rocky Mountains here in Colorado. 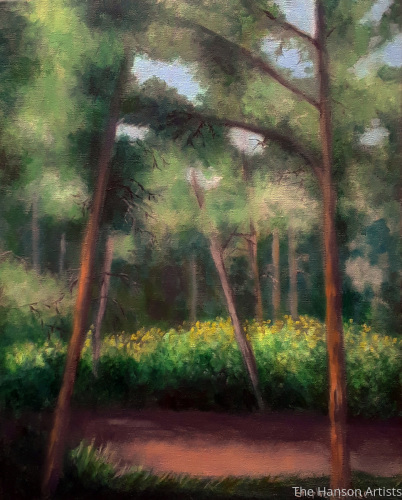 I've always liked forests and trees. 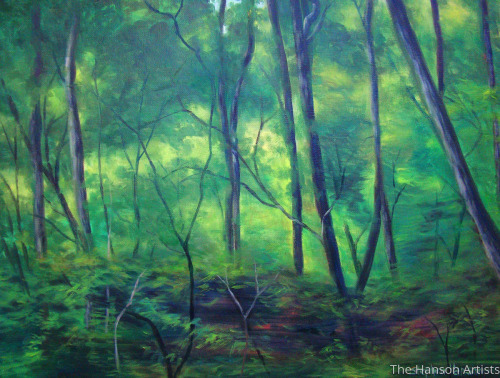 Even though this painting is filled with one color overall, there are many different shades of green in it. 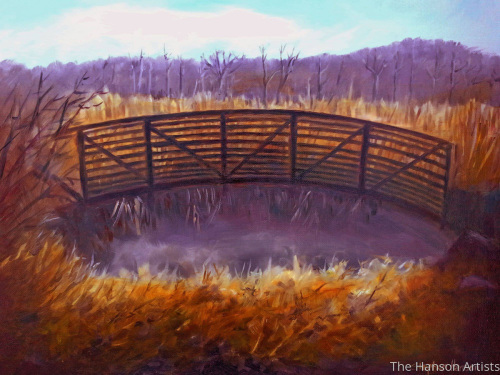 Even in the colder fall months one can find beautiful places to paint. This is along a creek in Colorado Springs. 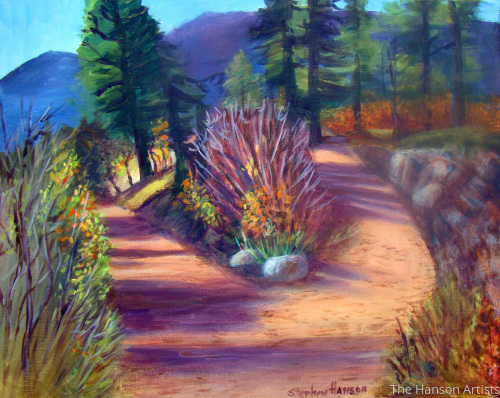 During the fall months several years ago, I picked up my easel and headed for Cheyenne Canyon, which is just a short distance from Colorado Springs. 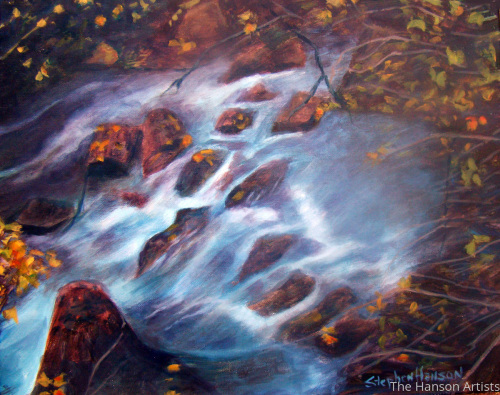 The fall colors and flowing stream offers one a place of beauty and peace. 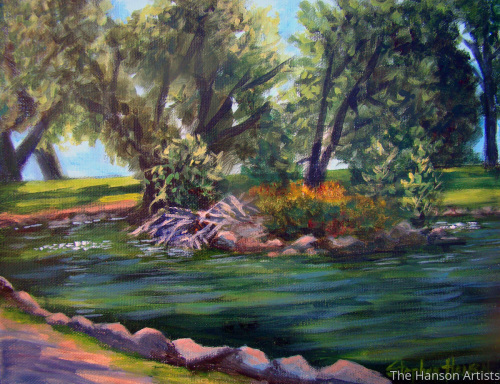 5.75" x 5"7" x 6"8.25" x 7"9.25" x 8"10.5" x 9"13.75" x 11.75"
This is one of the first plein `air paintings I've done. 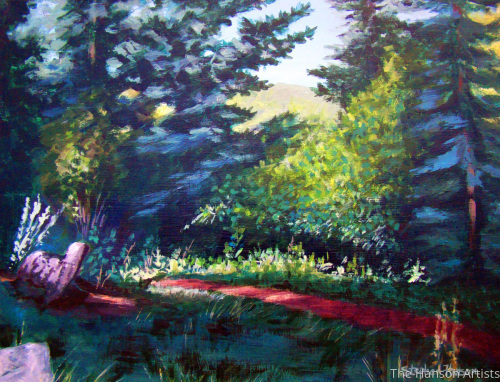 I found this little spot near Colorado Springs, and worked on it for a couple days until it was finished. I found a unique place up in the mountains to paint this. 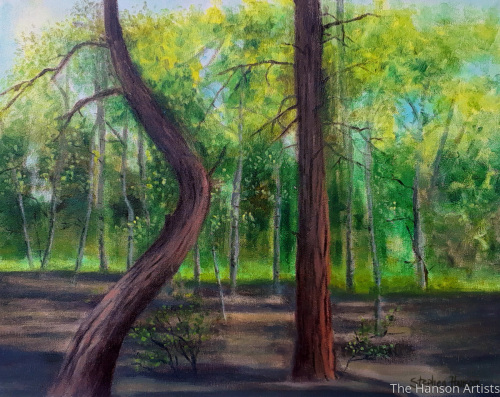 There are so many different shades of green and other hues to find in the trees. 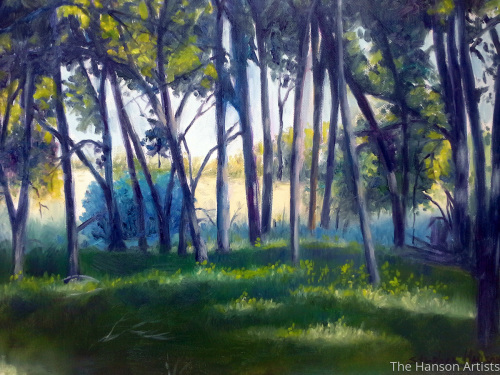 5" x 6.5"6" x 7.75"7" x 9.25"8" x 10.5"9" x 11.75"10.25" x 13.5"
It was a rather cool day when I painted this scene at the nature center in Fountain, Colorado. 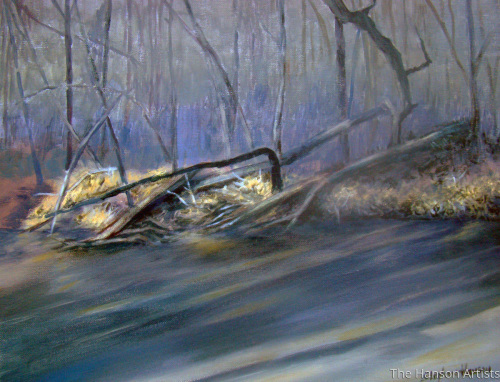 However, the browns and muted tones offered me a subtle and interesting pallet to work from. 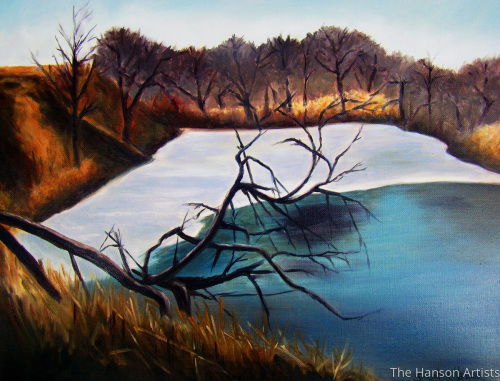 "Fall at the Nature Center"
I thoroughly enjoy painting at this spot. 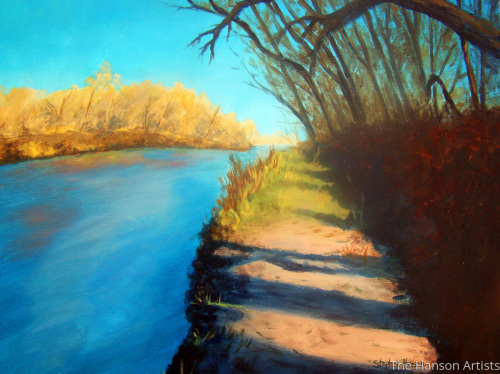 One can come year year round to see the sights, paint, or simply take a walk. Yet another scene from the Fountain Creek Nature Center. 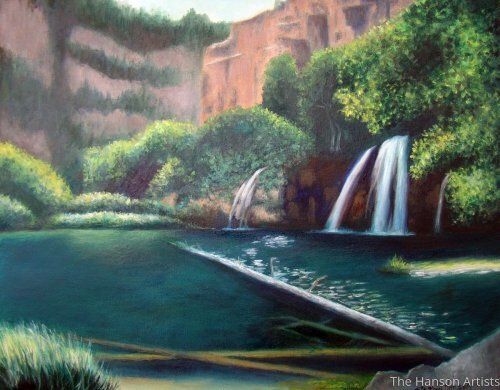 This place offers one a place to go and hike or just enjoy the scenery. 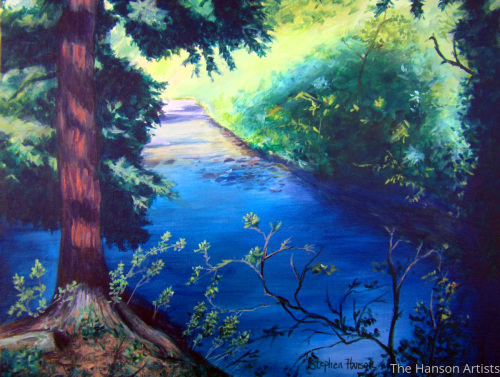 During the summer months there are hidden and wonderful little places to find that one can paint. I found this spot just south in a park at Fountain, Colorado. 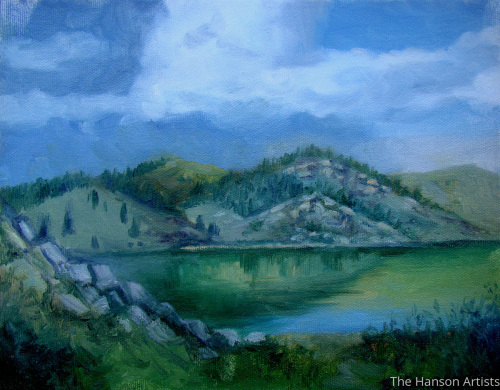 5" x 6.75"6" x 8"7" x 9.25"8" x 10.75"9" x 12"9.5" x 12.75"
I have painted several paintings from this area just to the south of where we live in Colorado Springs. 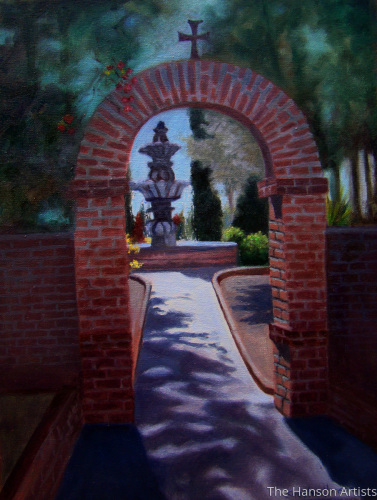 It's a beautiful place to visit, paint, read, or whatever. 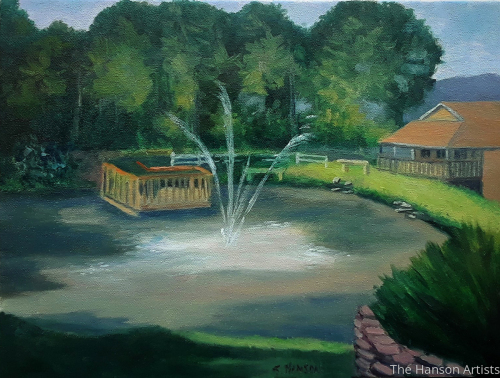 5" x 6.75"6" x 8"7" x 9.25"8" x 10.75"9" x 12"11" x 14.75"
Someone asked me to do a painting of a childhood place that they were fond of. This is a place up in the mountains in Colorado. 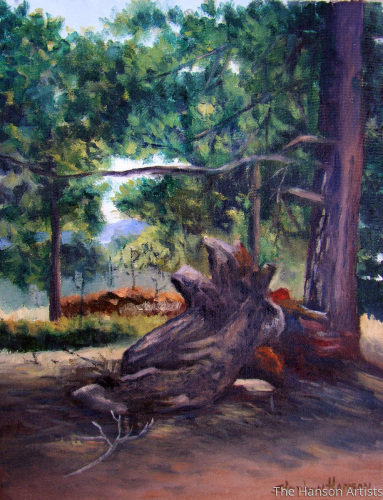 6.5" x 5"7.75" x 6"9" x 7"10.5" x 8"11.75" x 9"13.75" x 10.5"
"A Single Tree in the Forest"
Another painting in particular, of an interesting old tree in Fountain, Colorado. 6.25" x 5"7.5" x 6"8.75" x 7"10" x 8"11.25" x 9"12.5" x 10"
This painting is about the warmth that is sometimes seen, even during the Winter months. 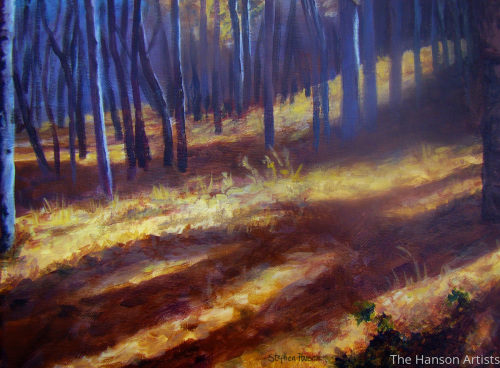 --When visiting my home town in Kansas, I noticed the morning light as it poured through a hedge grove, and just had to paint it. 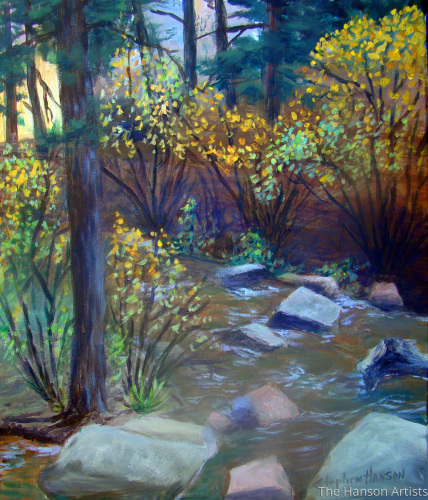 This landscape painting was done a few years ago along a creek in Colorado Springs. 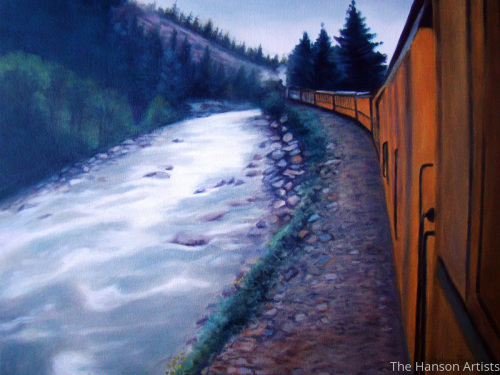 There are many places that an artist can find to paint, and sometimes they're not far away. In visiting Kansas a few years ago, I was struck by the wheat fields that had been recently combined. There is beauty to be found there. 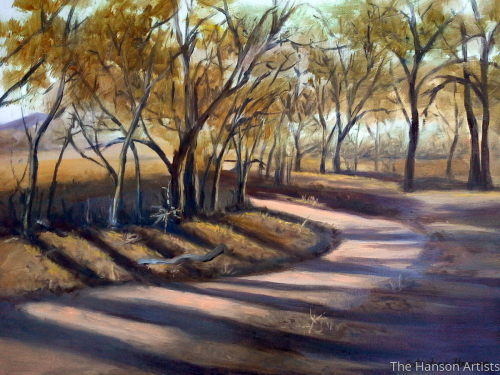 5" x 6.5"6" x 8"7" x 9.25"8" x 10.5"9" x 11.75"10.25" x 13.5"
A painting from a wooded area in Kansas during the fall. The light and shadows drew me in and sparked my interest. "The Light in the Forest"
Depicting light in a painting is perhaps one of the most important things for the artist. 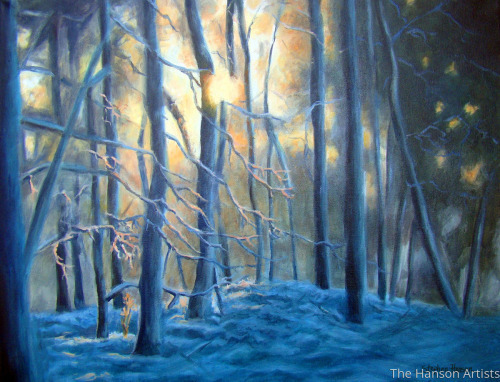 It can evoke a sense of warmth or mystery, especially in a forest. 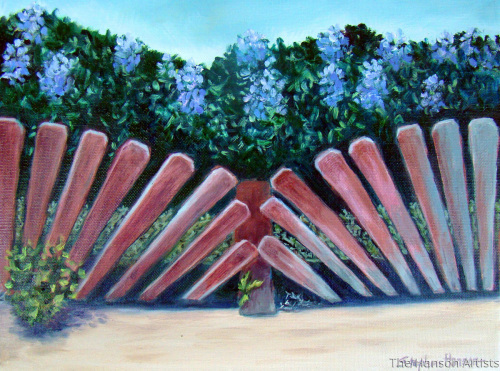 5" x 6.75"6" x 8"7" x 9.5"8" x 10.75"9" x 12"10.25" x 13.75"
I saw these lilacs on the other side of a fence a few years and knew that I just had to do a painting of it. 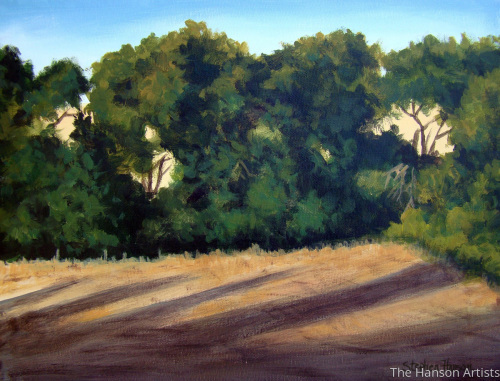 5" x 6.75"7" x 9.5"
"Early Morning Shadows and Light"
This past summer we spent some time camping at a nearby spot west of Colorado Springs. 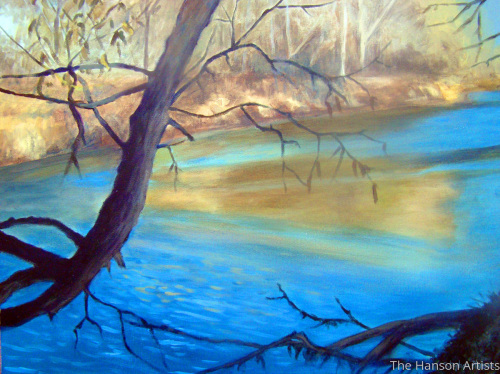 The nearby stream was beautiful and the light was incredible as it cast its light and shadows upon the water. 5" x 6.75"6" x 8"7" x 9.25"8" x 10.5"
A few years ago my family and I found wonderful little camping spot. 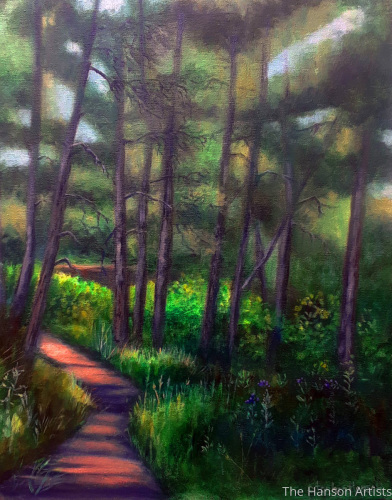 There was a pathway that led into the trees, and it seemed like the perfect spot to paint. 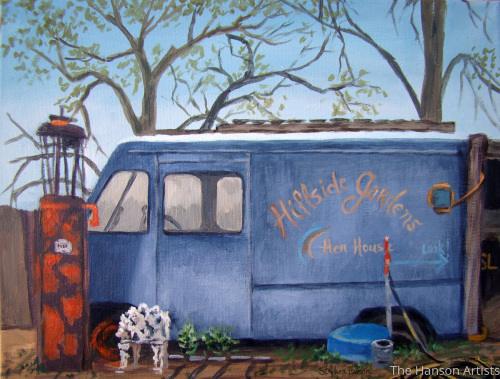 6.75" x 5"8" x 6"9.5" x 7"10.75" x 8"12" x 9"13.5" x 10"
--This painting is just a few miles from where my grandparents live years ago. 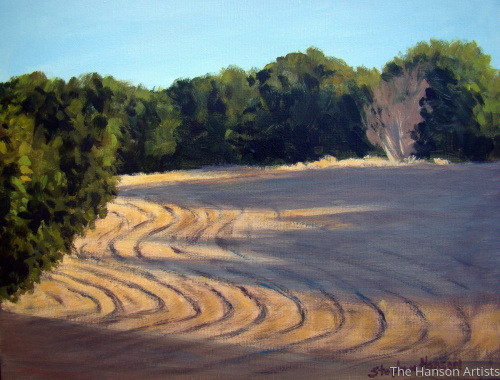 5" x 6.5"6" x 8"7" x 9.25"8" x 10.5"9" x 11.75"10.5" x 13.75"
Sometimes the colors in a landscape painting don't have to bright or vibrant. 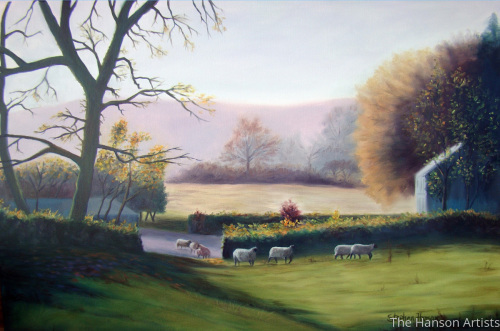 One can find subtle tones in nature to enhance the serenity of the scene. 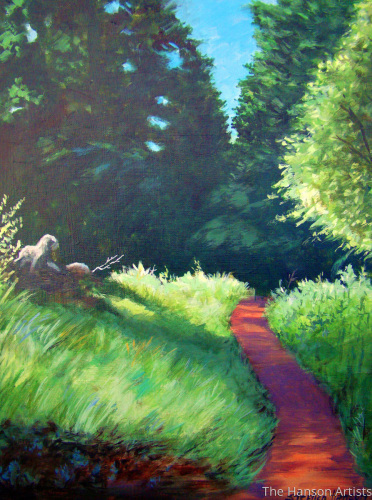 This is my first of many paintings I intend to do of spring. 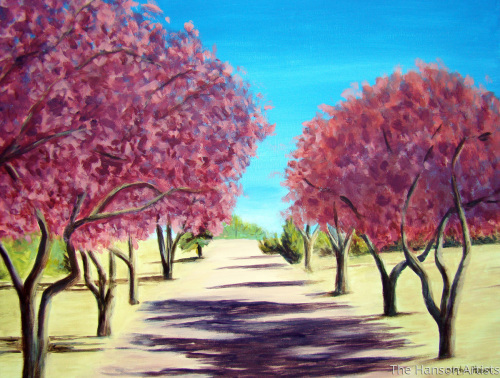 I look into anticipation for the warm showers, blossoms, both pink, blue, and a myriad of other colors. 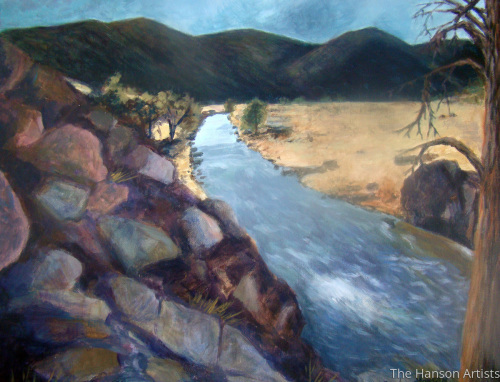 "The Cattle on a Thousand Hills"
This painting is inspired from a family reunion a while back to Coldwater, Kansas. 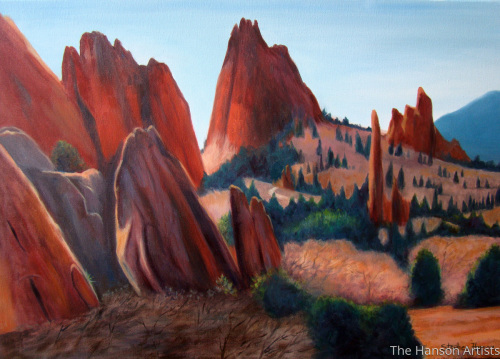 5" x 10.25"6" x 12.25"7" x 14.25"8" x 16.25"8.25" x 17"
We live in a beautiful place in Colorado where Colorado Springs has the amazing rock formations of The Garden of the Gods. 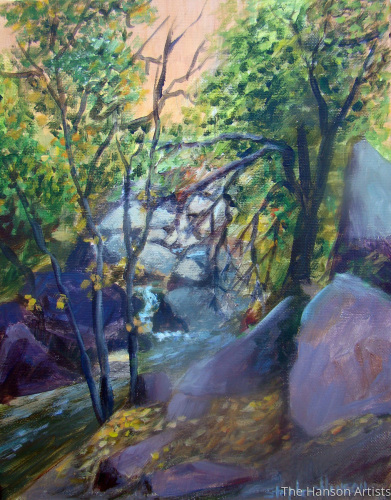 This painting in oil, features the beautiful jagged rocks that are the signature marking of this area. 5" x 7"6" x 8.25"7" x 9.75"8" x 11.25"9" x 12.5"12.25" x 17"
5" x 6.75"7" x 9.25"9" x 12"11" x 14.75"12.75" x 17"
If I could live on a farm like this, in a surrounding place with sheep and a sense of peace, I would move. 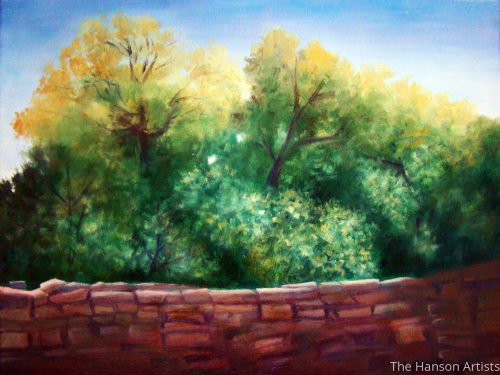 5" x 7"6" x 9"7" x 10.5"8" x 12"9" x 13.5"
This view is from Cheyenne Canyon again where I've painted several different paintings over the years. 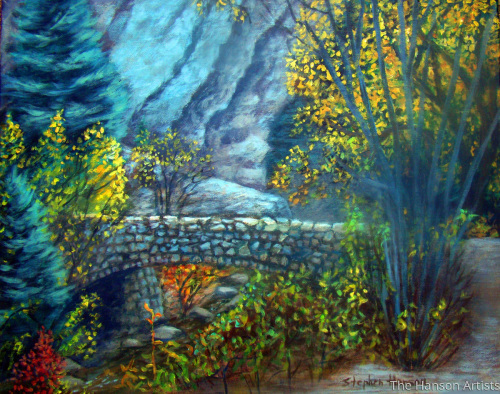 This one features a stone bridge during autumn. 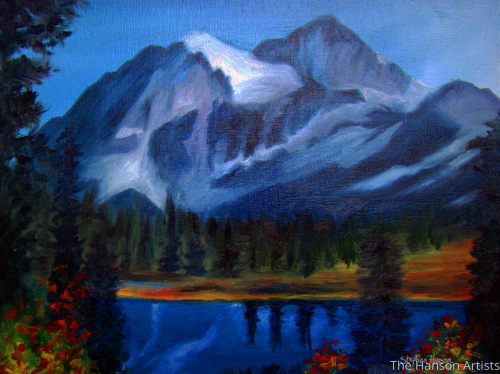 5" x 6.25"6" x 7.75"7" x 9"8" x 10.25"9" x 11.5"10.75" x 13.75"
"Morning Light Upon the Mountain"
This painting shows the light as it falls upon a mountain peak in an area near Aspen, Colorado. I've visited this place now several times over the last few years, and have found some really beautiful displays of all kinds of flowers. 5" x 6.5"6" x 7.75"7" x 9"8" x 10.25"9" x 11.75"10.5" x 13.75"
Another camping spot enabled me to capture the beauty of aspens beyond some gnarled old ponderosa trees. 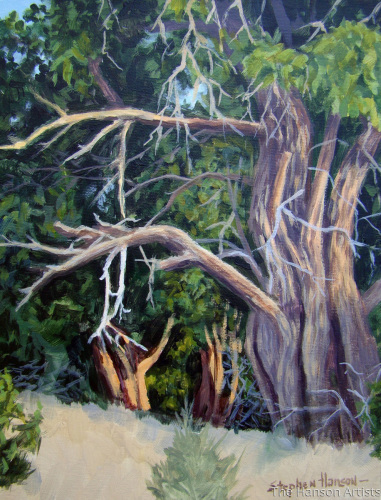 I've always been drawn to old gnarled trees. This one stood out against the cliffs behind it. 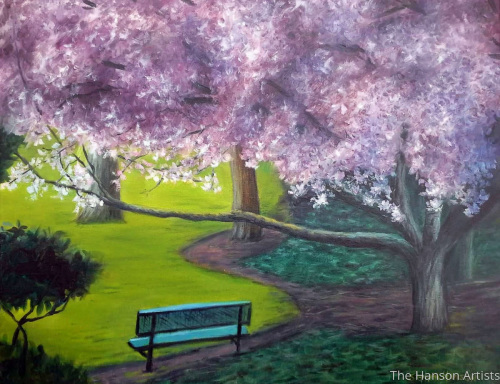 I did this painting several years and have always been fascinated by the pink blossoms. A former student of mine purchased this one. 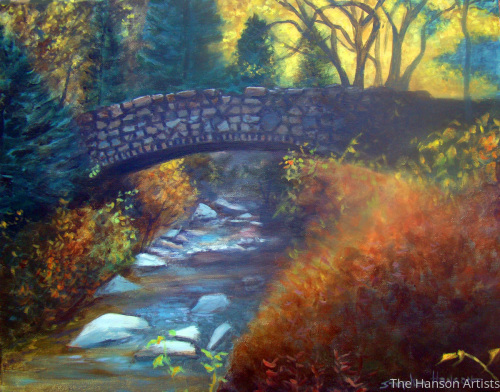 "Over the Bridge in Autumn"
I visited an area south of Colorado Springs a few years and found a beautiful little pond area that had a bridge. 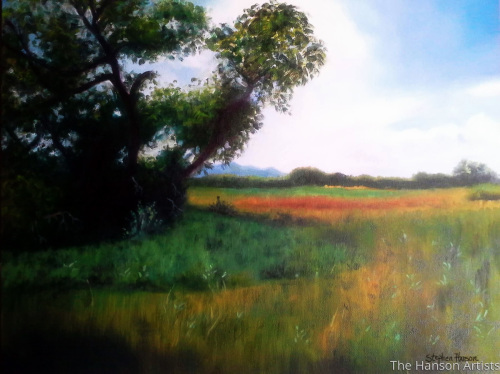 This was painted during the autumn months. 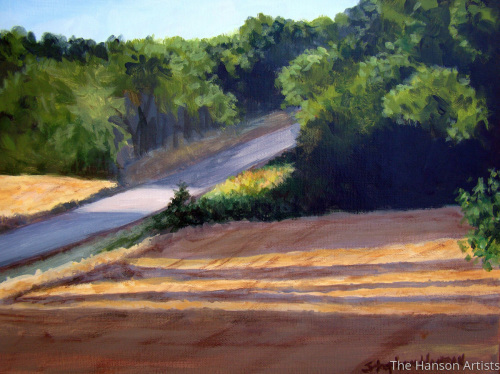 5" x 7"6" x 8"7" x 9.25"8" x 10.75"9" x 12"10" x 13.25"
One of three paintings I've done of the wheat fields in Kansas. The light and the shadows created a sense of nostalgia and beauty to me. I was struck by the two paths that could be taken on this mountain trail. There was even a spiritual significance of this to me. 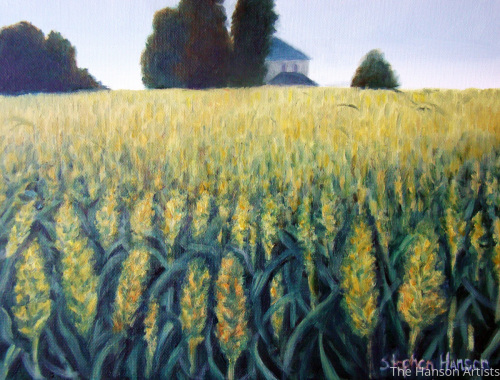 This is one of three paintings that I've done of the wheat fields in Kansas. There is a special beauty to be found there. One a recent excursion back to Kansas, we stopped along the road and found an interesting creek that had wonderful reflections and shadows. 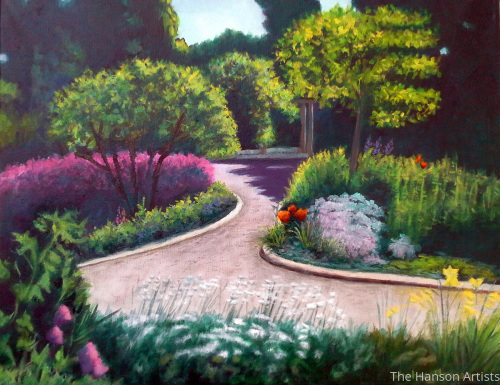 This is a commission piece that I did for my mother-in-law. She took a recent trip along with her two daughters, and also rode on the train. 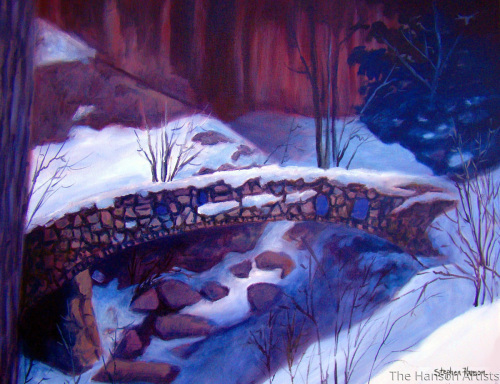 And now during the winter months I decided to do yet another painting of bridge that is found in Cheyenne Canyon. 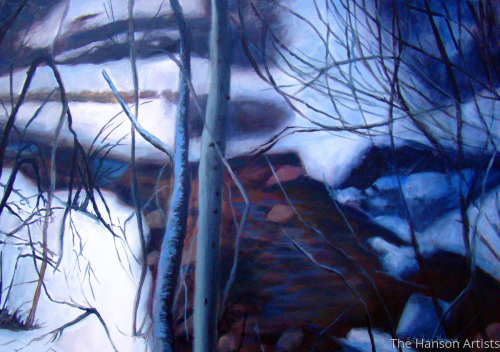 Just as I had done several paintings during the fall and winter months, I decided to do some of the mountain stream here at Cheyenne Canyon. This is yet another view of the trees at the camping spot in Monument, Colorado. This particular stone bridge with the cliffs behind, caused me to think of the wizard Gandalf as he was about to fall as he battled the Balrog on the bridge at Moria. I found this area of trees in a clearing a few years ago. 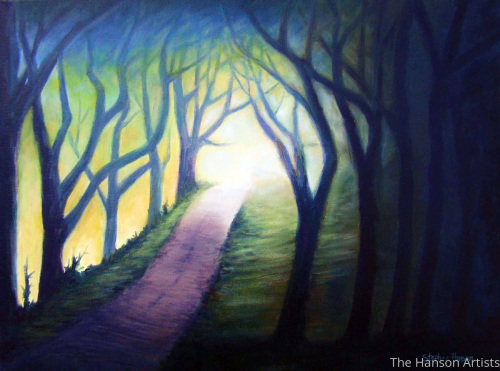 I was struck by the light and the shadows as they danced across the ground. 5" x 7"6" x 8.25"7" x 9.5"8" x 10.75"9" x 12.25"10" x 13.5"
5" x 6.5"6" x 7.75"7" x 9"8" x 10.25"9" x 11.5"10.75" x 13.75"
This oil painting is from a view of an RV park that we have been staying at in Monument, Colorado. The pond has fish in it, and the trees and light are wonderful around here. 5" x 6.5"6" x 8"7" x 9.25"7.75" x 10"
At Tres Rios RV park there are many wooded areas with wonderful twisted trees and foliage. 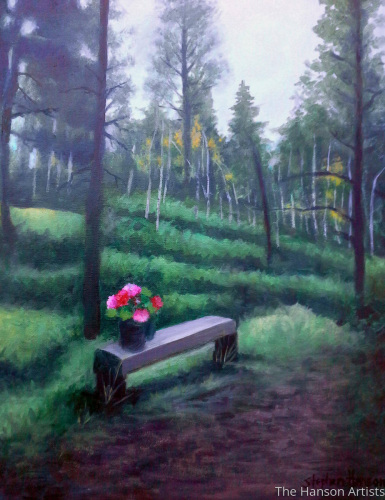 It has some unusual places to just relax or to paint. 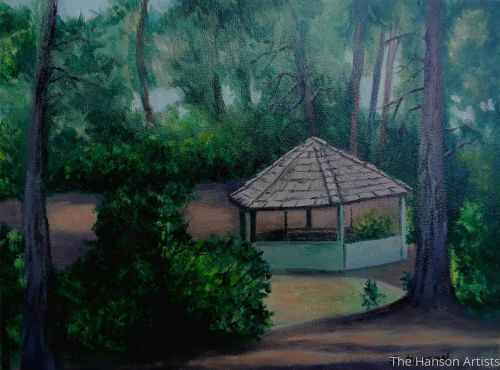 Hidden in the forest is a gazebo right next to a pond with surrounding Ponderosa pines and oak shrubs. We've stayed here off-and-on throughout the summer, as we now are full-time in our travel trailer. 5" x 6.75"7" x 9.5"9" x 12.25"11" x 14.75"12.75" x 17.25"